Yes, yes, I’ve heard ALL the jokes about being bored, and even intensely bored. I learn to deal with it. 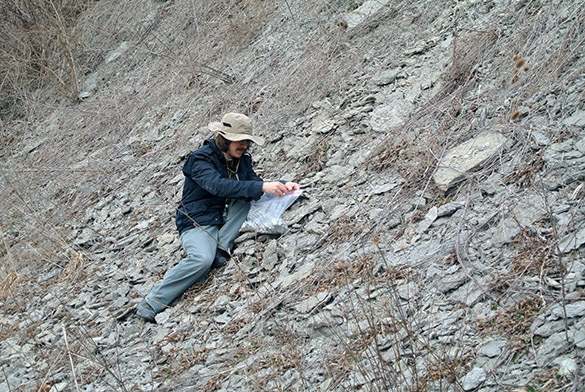 This week we continue to highlight fossils collected during our productive expedition to the Upper Ordovician (Cincinnatian) of Indiana (with Coleman Fitch ’15) and Kentucky (with William Harrison ’15). Last week was Coleman’s turn; this week it is William’s. The beautiful fan-like bifoliate (two-sided) trepostome bryozoan above was collected from the lower part of the Grant Lake Formation (“Bellevue Limestone”) at our locality C/W-152 along the Idlewild Bypass (KY-8) in Boone County, Kentucky (N 39.081120°, W 84.792434°). It is in the Maysvillian Stage and so below the Richmondian where Coleman is getting most of his specimens. 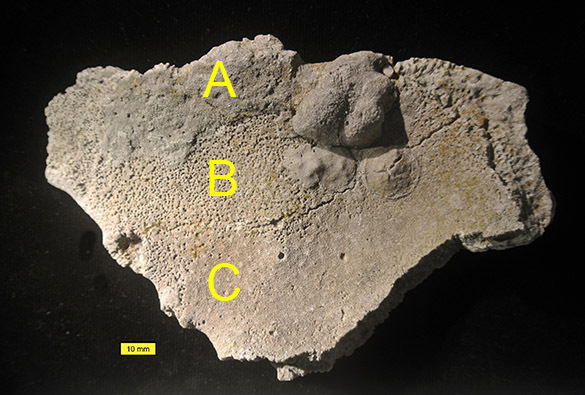 I’ve labeled it to show: A, additional bryozoans encrusting this bryozoan; B, a very bored section; C, a less bored surface showing the original tiny zooecia, monticules, and a few larger borings. The other side of this bryozoan is more uniform. It has an even distribution of small borings and no encrusters. 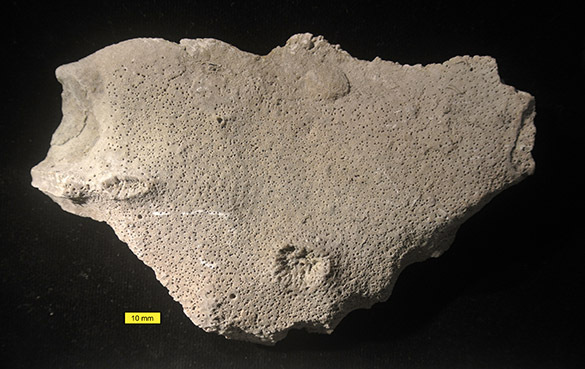 This likely means that at some point after the death of the bryozoan and subsequent bioerosion this side was placed down in the mud while the exposed opposite side was encrusted. 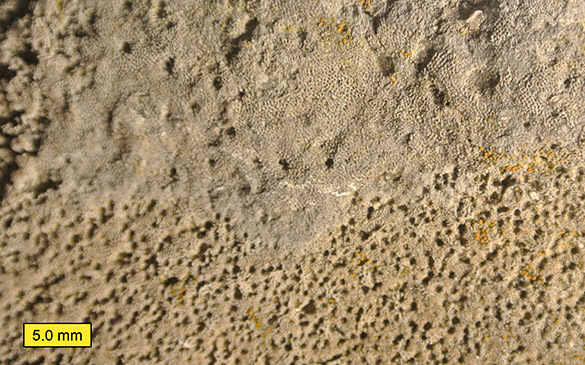 A closer view of the upwards-facing side (with the encrusting bryozoan at the top) shows just how intense the boring was prior to encrustation. Some of the borings are close to overlapping. 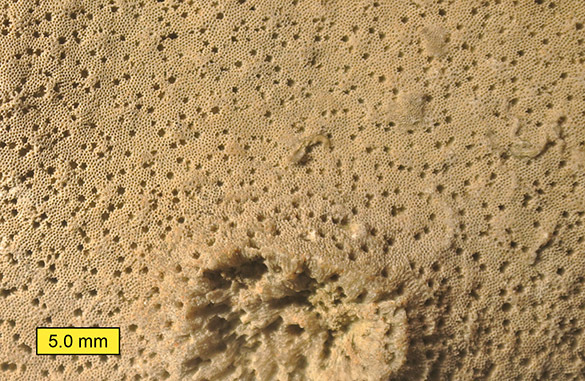 The encrusting bryozoan has its own borings, but far fewer and significantly larger. In this close view of the downwards-facing side we see lots of the small borings. Some are star-shaped if they punched through the junction of multiple zooecia. Note that these borings are rather evenly spread and seem to have about the same external morphology and and erosion. Likely they were all produced about the same time. It must have been a crowded neighborhood when all those boring creatures were home. William has plenty of fun work ahead of him! Bromley, R.G. 1972. On some ichnotaxa in hard substrates, with a redefinition of Trypanites Mägdefrau. Paläontologische Zeitschrift 46: 93–98. Erickson, J.M. and Waugh, D.A. 2002. Colony morphologies and missed opportunities during the Cincinnatian (Late Ordovician) bryozoan radiation: examples from Heterotrypa frondosa and Monticulipora mammulata. Proceedings of the 12th International Conference of the International Bryozoology Association. Swets and Zeitlinger, Lisse; pp. 101-107..
Kobluk, D.R. and Nemcsok, S. 1982. The macroboring ichnofossil Trypanites in colonies of the Middle Ordovician bryozoan Prasopora: Population behaviour and reaction to environmental influences. Canadian Journal of Earth Sciences 19: 679-688. Taylor, P.D. and Wilson. M.A. 2003. Palaeoecology and evolution of marine hard substrate communities. Earth-Science Reviews 62 (1-2): 1–103. Vogel, K. 1993. Bioeroders in fossil reefs. Facies 28: 109-113.